The new 3D printing suite in the NRF is now open for business! The new facility houses our Stratasys Objet 260 Connex 1, Stratasys Dimension uPrint and Dolomite Fluidic Factory 3D printers. In addition we have two new custom built CAD & SolidWorks stations for the design and manipulation of 3D solid models. Stay tuned as we will be adding more cutting edge printers to this suite in the near future to expand our capabilities. Our Nanoscribe Professional GT 3D laser lithography system is now housed in a purpose built pressure cascaded room to avoid particle contamination during printing. Parts can be developed and cleaned in the recirculating fumehood within the room, allowing all steps of fabrication and finishing to be completed in this ‘clean’ environment. Cu(II) Complexes: Pro or Anti-oxidant activity in Cancer cells? 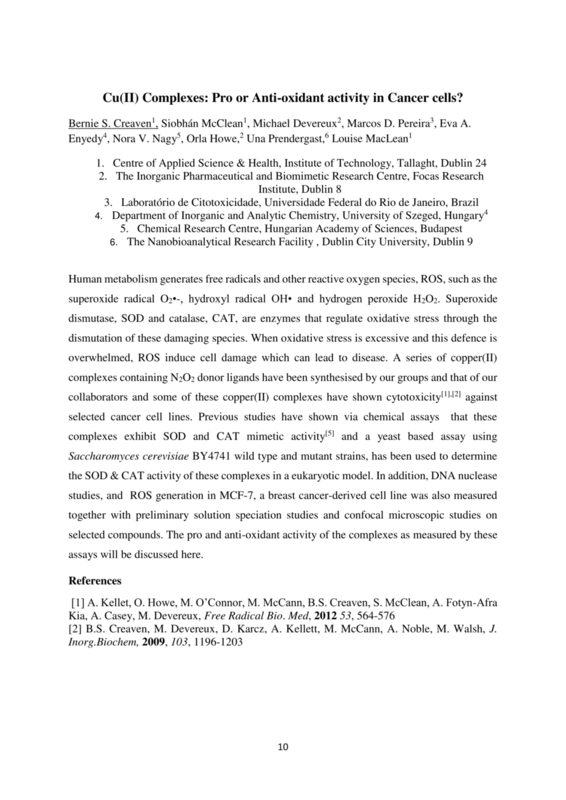 Dr. Bernie Creaven (IT Tallaght) presented her work on Cu(II) Complexes in Cancer Cells at the Irish Biological Inorganic Chemistry Society IBICS-1 Symposium in Maynooth last week. The imaging work in this study was carried out in collaboration with the NRF @DCU using our Leica SP8. The NRF is delighted to announce it's new particle size analysis capabilities! We have recently taken delivery of a new Malvern Mastersizer 3000 particle size analyser. The Mastersizer 3000 is a laser diffraction particle size analyzer that delivers rapid, accurate particle size distributions for both wet and dry dispersions. It is capable of measuring over the nanometer to millimeter particle size ranges. We are also is in the process of installing a Bekman Coulter Delsa Nano C. This is dynamic light scattering analyzer which can measure nano particle size and zeta potential. Keep an eye on our website in the coming weeks as these will be soon available for access and training. Congratulations to Dr. Andrew Kellett's group for their two recent publications! Both papers include work that was carried out on NRF equipment. In their Redox Biology paper "Triggering autophagic cell death with a di-manganese(II) developmental therapeutic" , they used the CD spectrometer to investigate drug-DNA binding interactions and the NRF Leica SP8 STED to acquire confocal images of SKOV3 cancer cells treated with a manganese complex. The NRF's newest equipment has just arrived! We have just taken delivery of a new Perkin Elmer Spectrum Two FTIR Spectrometer and a Perkin Elmer LS55 Fluorescence Spectrometer! The Perkin Elmer LS 55 luminescence spectrometer is a very versatile instrument that allows measurement of fluorescence, phosphorescence, and chemiluminescence or bioluminescence of a liquid, solid, powder, or thin film sample. The instrument is simple to operate and is controlled by easy-to-use software. Get 2017 off to a well defined and characterised start with our Surface Metrology Seminar and Workshop on February 8th and 9th in the NRF @ DCU. See what can be done with AFM, Stylus profilometry and Optical profilometry. With hands-on sessions and talks by Bruker Applications Engineers. Please click here to register for this workshop. More new equipment for the NRF! Also, our new Perkin Elmer LS55 Fluorescence Spectrometer and Spectrum two FTIR are being delivered and installed this week! More information to follow.